SWM was born and raised in Philadelphia, a son of Dr. John Kersley Mitchell, a graduate of the University of Pennsylvania Medical School and member of the Jefferson faculty, and the third of nine children borne by Sarah Matilda Henry. He was raised in a family setting stressing versatility in reading literature as well as writing and reciting poetry8. He went to Penn as an undergraduate, but was a desultory student, preferring reading and billiards to his studies. He left after several years to help his family because his father had fallen ill. Even though Mitchell felt SWM had little aptitude for medicine, he entered Jefferson Medical School in 1848, graduating in 1850 at the age of 21. Figure 1. Frontispiece of A.R. 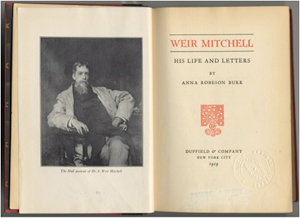 Burr’s book, “Weir Mitchell: His Life and Letters,” including portrait of Silas Weir Mitchell, published in 1929 by Duffield and Company, New York. SWM and his sister, Elizabeth, went to Europe where he spent time with Claude Bernard, the Parisian physiologist who taught him “if you need an answer, do an experiment.” He applied for an internship at Pennsylvania Hospital, but was turned down for political reasons connected with his father. He joined his father’s practice and then assumed it when he retired in 1855. During that period, he became an experimental physiologist studying among other topics, the effect of rattlesnake venom on various animals, the blood crystals of sturgeons, the generation of uric acid and the mental effects on himself of ingestion of mescal buttons10,11,12. Figure 2. 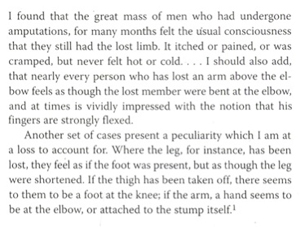 Text extracted from Silas Weir Mitchell’s publications about phantom limb pain (syndrome). SWM published many scientific papers, his neurologic practice thrived and he found time to write “Wear and Tear: Hints for the Overworked” (1871). It sold out in 10 days, and four other editions were published. He also published “Fat and Blood” (1877). Eight editions were published. He married Mary Middleton Elwyn in 1858, and she bore two sons. Tragically, they both died of diphtheria in 1862. He remarried Mary Caldwalder from a socially prominent Philadelphia family in 1874. That same year, he lost his sister, to whom he was very close, also to diphtheria. Yet another family tragedy included the loss of a daughter from his second marriage whom he doted on. She was 22 years old. This prompted his publication of a poem, “Ode to a Lycian Tomb,” which again for that period became quite popular13. SWM had developed a keen interest in mental disorders, and he used that in a very descriptive way with his fictional characters. His literary detractors even extolled that trait, but faulted his lack of substantial plots or at least ones that moved along. He did tend to emphasize the genteel in society instead of the common man. He ignored or failed to develop any fictional, sexual encounters or connotations5,8. Despite these criticisms about plots, one can find distinct exceptions among these novels. Thus, substantial plots at least for this reader can be found in “The Adventures of Francois — a French Revolution Juggler and Thief” (1897) or “Hugh Wynne. Free Quaker: Sometime Brevet Lieutenant — Colonel on the Staff of His Excellency General Washington” (1896) and “Constance Trescott” (1905). “Constance Trescott” portrays a vengeful widow who moves to Missouri from New England shortly after the Civil War. Figure 3. The frontispiece of J.P. Lovering’s “S. 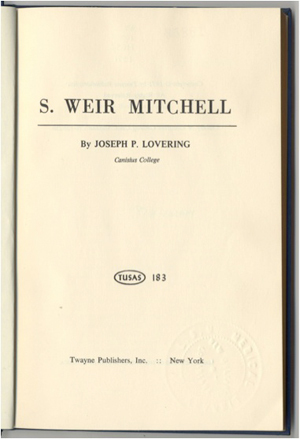 Weir Mitchell,” published in 1929 by Twayne Company, New York. Despite moving into the top social circles in Philadelphia, SWM treasured his medical and fictional authorship more than social pleasures. Perhaps in part because of his social status though as well as his popularity as a physician, he was made a trustee at Penn in 1875 and helped found a Department of Mental Diseases, mentoring two subsequent chairs — Mills and Burr7. He recruited William Osler from Canada to the chair of the Medicine Department and even helped his son obtain an academic appointment, something he had always cherished for himself but never gained at least as a chair at either Penn or Jefferson. Mitchell became president of the Association of American Physicians (1887), president of the American Neurological Association (1908-1909) and was given honorary degrees at Harvard, Edinburgh, Princeton and Toronto before dying of influenza in January 19141. He was buried in the Philadelphia area in the Woodland Cemetery16. Figure 4. 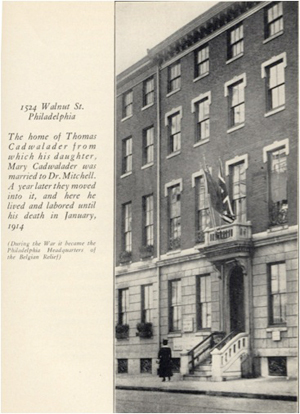 Mitchell’s final home with Mary Caldwalder, 1524 Walnut Street, Philadelphia. On this home was mounted a brass plaque commemorating his many lifetime accomplishments. Kline is the Emeritus Chair and Boyd Professor, Louisiana State University Medical Center, New Orleans, Louisiana. Tonic neck reflexes in animals and men were described by Magnus and de Kleyn in 1912. It became his most important publication and remained unsurpassed for the next years. A film from the years 1916-1919, with Arthur Simons as examiner, shows these nearly forgotten phenomena. (See Figure 1.) He already emphasized their everyday significance in 1920, long before the rules of antispastic positions were defined by Bobath. After several clinical activities, mostly in unpaid positions, and subsequently as the leading assistant in the outpatient service (Poliklinik) of Hermann Oppenheim in the years before WWI, Simons (1877-1942) had to do military service as a physician from 1914 to 1918. He succeeded in assembling neurological case reports and publications to fulfill the academic requirements for the “Privatdozent” or “Habilitation Act” in 1921 and for a professorship (a.o.= extraordinary professor) in 1923. After Oppenheim’s death in 1919, he worked in an outpatient practice and as consultant neurologist in Berlin hospitals until 1933, where he was continuously deprived by the Nazi regime, because of his Jewish origin. Requests for immigration to England failed and meanwhile his private practice lost more and more patients. In 1938, he lost his medical license and had to accept the profession of “Krankenbehandler.” Alimony for his divorced wife forced him to sell more and more of his art collections as well as his household. In September 1942, he did not return from a citation to the Gestapo, and after intermediate detention in October 1942, he was taken to Reval (the present Tallinn, Estonia) where he was murdered. In 1912, Magnus and de Kleyn, in the Netherlands, studied in detail the labyrinthine and the postural reflexes in animals as well as humans. Following Rudolf Magnus, tonic neck reflexes are the consequence of a change of the position of the head in relation to the trunk, which causes an increase or decrease of tonus of ipsilateral muscles (asymmetrical tonic neck reflexes), while dorsi- and retro-flexion of the head results in bilateral change of tonus (symmetrical tonic neck reflexes). As a result of Magnus’ animal experiments, the anatomical basis of tonic neck reflexes could be located in the upper cervical spine. They are decreased after extirpation of the first cervical root and completely disappear after cutting of the second cervical root. Tonic neck reflexes are elicited in the newborn during the first weeks and reappear only in cerebral disease. After the coincidental observation in his first patient at the military hospital, Simons wrote: “In the autumn 1916, I examined a hemiplegic patient in the field two months after an injury by gunshot in the head”1. Simons undertook a thorough series of investigations, and at the end of the war, he had observed 31 hemiplegics. By 1919, he had seen 248 cases, of which 25 percent presented tonic neck reflexes with hemiplegic “Mitbewegungen” (synkinesias). He produced a film (Filmarchiv, Bundesarchiv, Berlin) that shows 11 cases from the years 1916-1919, mostly with war brain injuries. The asymmetric neck reflexes with flexion or extension on the hemiplegic side, called “Mitbewegungen” (synkinesias), identical to Francis Walshe’s “associated reactions” (1923)2, are induced (increased or varied) by neck rotation with simultaneous co-contraction of the non-affected extremities, e.g. by closure of the fist. They are restricted to the paralyzed side. The stills shown in Figure 1 are taken from the film. Investigations by Simons and Walshe were done exclusively in the adult and awake hemiplegic, show that tonic neck reflexes are bound to a lesion of the pyramidal tract and should be understood as a form of decerebrate rigidity. They belong to Magnus’ postural reflexes, or “Stellreflexe,” the English term of which is “position” or “righting reflexes” and are situated in the brain stem. Walshe was fair enough to acknowledge Simons’ milestone discovery in his final addendum. In 1925, the Hamburg neurologist Heinrich Pette stated in his own investigation on tonic neck reflexes that “up to now, they remain unique in this manner of large scale work.” The reproduction of Simons’ film stills by Magnus in his 1924 Körperstellung3, by Rademaker in his 1931 Das Stehen, as well as by Stenvers in his chapter in Bumke’s & Foerster’s Handbook of Neurology (Vol. 5, 1936) bestowed them a historical value. After that period, the couple Berta and Karl Bobath, in their English exile, used the neck reflexes in physiotherapy and position of hemiplegics in order to decrease their spastic tonus, unfortunately relying only on Walshe’s work and not on Simons’ efforts. 1. Simons A (1923) Kopfhaltung and Muskeltonus. Ges.Z. Neurol.Psychiatr. 80: 499-549. 2. Walshe FMR (1923) On certain or postural reflexes in hemiplegia, with special reference to the so-called “associated movements.” Brain 46: 1-37. 3. Holdorff B (2012): Arthur Simons (1877-1942) über tonische Halsreflexe beim Hemiplegiker aus den Jahren 1916-1919. Nervenarxt 83: 514-520. Holdorff is the former head of the neurologic department Schlossparkklinik, Berlin. Koehler is the editor of this history column. He is neurologist at Atrium Medical Centre, Heerlen, The Netherlands. Dr. Laszlo Sztriha discussed mobility across countries. During neurology training, there are crossroads where the best decision is based on advice from more experienced colleagues and professors. The choice to dedicate to research or pursue the clinical path is among the first steps, and visiting departments of other sites may aid in building a career plan. The European Association of Young Neurologists and Trainees (EAYNT) is a non-profit independent organization aimed at linking young neurologists across Europe in respect to educational and exchange of experience opportunities. In the last 14 years, it has brought together young neurologists at its Special Sessions organized at EFNS meetings where experienced speakers have discussed aspects of training and planning professional development. 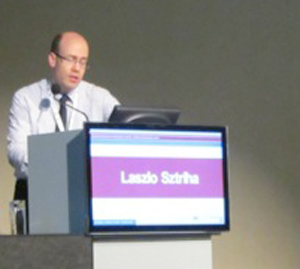 During the EAYNT Special Session at EFNS-ENS Joint Congress Istanbul 2014, Prof. Jose Ferro, Prof. Walter Paulus and Dr. Laszlo Sztriha offered lectures on the “Do’s and Don’t’s in Neurology Training” covering the complementary perspectives of research and clinical work of young neurologists. Sztriha from King’s College Hospital, London, talked about mobility across Europe during training in neurology as seen by a young neurologist. He showed that the goals of visiting a hospital in a different country include improving clinical expertise, research opportunities and possibilities to apply the new knowledge in home department. He also recommended identifying the most suitable place to visit — based on language compatibility — by looking for opportunities published on department homepages or journals or by meeting staff members at conferences or through special mobility programs that offer the opportunity to visit departments. He also discussed funding for EFNS and ENS programs, fellowship from home departments or from host institution. Sztriha also offered valuable practical advice regarding opportunities for experience exchanges for young neurologists. Prof. Jose Ferro identified research challenges. Prof. Jose Ferro from Santa Maria Hospital, Lisbon, Portugal, talked about the do’s and don’t’s of research. Ferro presented the steps a young researcher needs to take to build a successful career based on skills and knowledge and focused on the mission, which is determined by goals and values. He emphasized personal and interpersonal competencies of a researcher, as well as the importance of self-analysis. He also discussed the essential role of a mentor. He shared aspects from his own professional path as a researcher and presented the importance of working in foreign departments. The importance of being constant in the research topic and issues regarding authorship of papers were two important points of this talk. Ferro concluded by highlighting that determination and hard work are key characteristics of researchers who should never forget their missions. Prof. Walter Paulus from University Medical Center Goettingen, Germany, focused on do’s and don’t’s of clinicians. Paulus presented data regarding how satisfied trainees are with their training process through a German survey. Next, he showed the current work situation of a clinician, which is between growing clinical demands, the competition for research, more administrative issues to handle that are partially compensated by stability of job and a less stressful environment after work. The lecture continued with focus on attributes a successful clinician should have, including empathy, perseverance, ambition, structured thinking, curiosity and good clinical skills. On the contrary, he discussed characteristics that a clinician should not have: a lack of interest, insufficient skills, inappropriate attitude toward colleagues and forcing the symptoms into a diagnosis. 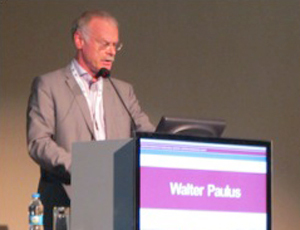 Prof. Walter Paulus discussed clinician training. Paulus highlighted the importance of minimizing the clinician’s own mental distress in order to ensure patient safety, and a good working atmosphere is a collective effort along with the information exchange and acquisition. He also talked about problems he observes in residents, including poor clinical judgment, patient management, absenteeism, inappropriate interaction and management through better supervision. He highlighted the importance of mentoring residents throughout their training. Neurology training represents a sequential process that needs personal effort to improve knowledge and skills, determination, understanding of the aims and goals and of methods to achieve them. In addition, there needs to be the touch of personality of a true mentor who not only teaches and supervises, but also serves as a model. The three lectures gave young neurologists the opportunity to have a better understanding of aspects of training both in clinical field and research, in home departments and abroad. Moarcas is with the Department of Neurology, Emergency University County Hospital Brasov, Romania. Readers of the Journal of the Neurological Sciences will soon notice a few changes between the covers. The Editorial Board and I are gradually changing the way in which case reports are handled and published. JNS continues to receive a large number of manuscripts submitted from around the world. Because of publication limitations, we can accept only a minority of these manuscripts for publication. Although case reports are usually considered reports of “anecdotal” observations, most clinical neurologists find them educational and interesting. Rather than reject all of these case reports, we have decided to publish many of them as “Letters to the Editor.” In this way, we can accommodate them within JNS. The journal also will be featuring more “editorials” to highlight and enhance important original articles, which will be published simultaneously. These will usually be solicited by invitation from one of the associate editors or me. However, if you are asked to review a manuscript for JNS and believe that an accompanying editorial would be useful, please provide this as a recommendation in your review. 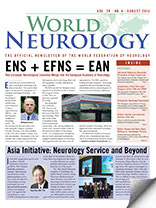 In our ongoing attempt to enhance accessibility of JNS articles to members of the World Federation of Neurology (WFN), we have selected two “free–access” articles, which are profiled in this issue of World Neurology. 1) In the first article, Dennis Paul and colleagues provide new observations about the ubiquitous and important Na+-K+ ATPase pump. This research team previously documented that inflammation results in an up-regulation of sodium channels (especially Nav1.7) in dorsal root ganglia (DRG). Using the same experimental paradigm, they have now demonstrated that there is a simultaneous up-regulation of the Na+-K+ ATPase pump. The researchers had hypothesized that this would occur since without an up-regulation of the Na+-K+ ATPase to pump Na+ out of the cells, an increase in Na+ influx would lead to an osmotic influx of water. Consequently, the DRG cells would swell and burst. As proof of the protective mechanism provided by an increase in the Na+-K+ ATPase pump, the authors blocked the activity of the pump with ouabain. This pharmacologic blockade resulted in the swelling and death of the DRG cells which had an inflammation-induced increase in Na+ channels. These observations have important implications for the pathophysiology of inflammatory conditions and concomitant neuropathic pain. They may have broader importance for the pathophysiology of other diseases such as diabetes mellitus, which is known to interfere with Na+-K+ ATPase pump expression and function. Specifically, interference with the function or blockade of the Na+-K+ ATPase pump might cause premature cell death in susceptible cells. Paul D, Soignier RD, Minor L, Tau H, Singu-Mize E, Gould HJ. Regulation and pharmacological blockade of sodium-potassium ATPase: A novel pathway to neuropathy. J Neurol Sci 2014;340:139-143. 2) In the second article, Craig Stevens provides a thoughtful and comprehensive editorial about the biological importance of the Na+-K+ ATPase pump. This paper serves as a brief primer on the importance of the Na+-K+ ATPase pump for maintaining the resting membrane potential and volume in all cells. He also highlights the growing evidence that Na+-K+ ATPase dysfunction may be involved in several neurological diseases in addition to peripheral neuropathy. Stevens CW. New pathways for an old molecule: The role of the Na+-K+ ATPase pump in peripheral neuropathy. J Neurol Sci 2014;340:3-4. The Sixth Regional Teaching Course (RTC) of the EAN took place in June in Lusaka, Zambia. 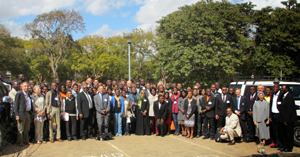 There were 124 participants from 20 Sub-Saharan countries in attendance. The course, which was organized by the EAN, was supported by a consortium of European and international scientific societies also by the WFN. An unrestricted educational grant was obtained from the Lundbeck International Neuroscience Foundation. The course faculty of international educators included: Erich Schmutzhard and Wolfgang Grisold (Austria); Riadh Gouider (Tunisia); William Howlett (Tanzania); Jean-Michel Vallat (France); Anthony Zimba and Masharip Atadzhanov (Zambia); Raj Kalaria, Peter Sandercock and Tim Steiner (UK); Amadou Gallo Diop (Senegal); Angelo Antonini (Italy); James Bower (U.S.); Osheik Seidi (Sudan); and Mehila Zebeginus (Ethiopia). This three-day RTC covered infection and nervous system disorders, including stroke and movement disorders and disorders of the peripheral nervous system. The topics were relevant and up to date. In addition to the teaching aspects, all of the visiting professors emphasized how the latest developments and ideas involved in the diseases under discussion could be implemented. The program was selected by participants from the previous year, based on a poll. The lectures were presented with PowerPoints. Some sessions were supported by video demonstrations. All presentations were followed by discussions, and there was time for questions after each main lecture session. At the end of each block, a question-and-answer session was allowed, which was highly interactive. The faculty joined in guessing the answers and in the discussions, and several academic points of view were aired. In the afternoon teaching sessions, a pair of lecturers demonstrated cases and encouraged participants to be actively involved in breakout sessions. These cases were either based on video demonstrations, images or classic narrative case descriptions. Participants were asked for their opinions. In some instances, an emphasis on a structural approach was studiously followed. This proved to be interesting, and the teaching sessions were highly informative. In addition, the participants were exposed to the different teaching styles of the faculty depending on the school of teaching (U.K., France, Italy, U.S.) or personal styles. Both the case discussions as well as the general discussions revealed positive and critical aspects: It seems that young neurologists are exposed to a huge quantity of diseases and patient needs in their countries, but they have limited resources in so many ways. But their knowledge and interest is great, and this is what makes this course exciting. Also, as a critical remark, their sometimes limited knowledge of English can be noted, and there is often some hesitancy to express their opinions in discussions with the teaching professors. Notably, however, the interaction between residents and faculty improved considerably during the course. Some selected lectures were given by young neurologists, which were technically well prepared, and discussed with the audience. A special experience was the session on “How to Write Paper.” Three experienced teachers — Dr. Gallo (Senegal), Dr. Kalaria (UK) and Dr. Bowers (US) — each gave a presentation and discussed many aspects, from the selection of a topic, the preparation, technical aspects of the manuscript and how to deal with journal editors and reviewers. There was an official reception on Thursday, which was attended by the First Lady of the State Christine Kaseba-Sata, Goodwill Ambassador to WHO, who gave the meeting an official standing. This cannot be estimated highly enough in a country with 40 million inhabitants and only one neurologist. 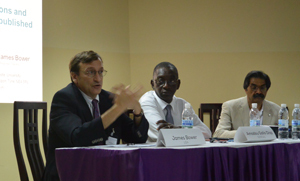 This meeting also was covered by local news and TV, which will likely increase the awareness of neurology in Zambia. Lunch and coffee breaks were used eagerly for information and exchange. The local neurology department is based on the work of Anthony Zimba and Masharip Atadzhanov. 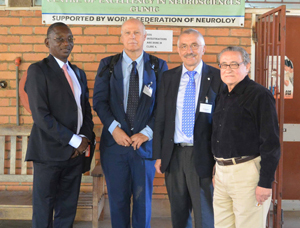 The department in Lusaka contains a WFN-sponsored neurological institute, which now has established EEG and EMG. The university has one MRI and laboratory investigation also offering PCR techniques for neuro-infectious diseases. This sixth course seems like a big effort to make, demanding a lot of resources for a small group of attendees in relation to the large number of countries without neurology services. However, all of the attendees are devotedly involved in neurology and are important proponents for neurology. Furthermore, this course can be considered the ignition or spark for newly developing neurological societies, units and neurologists. The fuel is the knowledge of the importance of neurology and education, which will drive the development in individual countries. An example is Ethiopia, which has profited from the first TC and which has since produced a training program. WFN’s role is to keep up this spirit of teaching, and encourage and partner with other organizations to improve this momentum of teaching, learning and creating neurology in Africa. To meet this continuing need, the EAN-led planning group met in Lusaka to plan the next course. The participants were asked to list three topics of interest they would like to see addressed in a future RTC. From the compilation of the suggested topics, two that had the highest number of requests were identified for the 2015 RTC. The seventh RTC will be held in October 2014 in Khartoum, Sudan, and will be hosted by Prof. Osheik Seidi and the University of Khartoum. The themes of the conference will be neuro-pediatrics and stroke. Grisold is with the Department of Neurology, Kaiser Franz Josef Hospital, Vienna, Austria. Young neurologists and trainees during the hospital visit at the Istanbul University Cerrahpasa School of Medicine Neurology Department, EFNS-ENS Joint Congress in Istanbul. The first Joint Congress of Neurology, combining both the European Federation of Neurological Societies (EFNS) and European Neurological Society (ENS), was held in June in Istanbul, Turkey. Each year, the European Association of Young Neurologists and Trainees (EAYNT) organizes several activities during the conference to give young neurologists and trainees from different cultural backgrounds all over Europe the opportunity to get together and exchange their individual, professional and personal experiences. In addition to the lottery, the photo contest and the special EAYNT session, one of the annual highlights of the EAYNT activities is a local hospital visit followed by a get-together. This year’s hospital visit led 90 interested and curious young neurologists and trainees to the Istanbul University Cerrahpasa School of Medicine Neurology department. The visit organized by the Congress President Prof. Aksel Siva and the Turkish Neurological Society. The participants learned about the general history of the hospital and the educational system in Turkey from hospital residents. 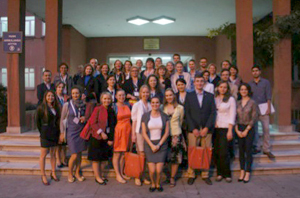 Young neurologists and trainees during their visit to the Istanbul University Cerrahpasa School of Medicine. In 1933, the Neurology Department was established. This makes it to one of the oldest institutions of higher education in Turkey. The current name Cerrahapasa School of Medicine was introduced in 1963 when the hospital was restructured and an additional Istanbul School of Medicine was founded. The Istanbul University Cerrahpasa School of Medicine is now one of the three Government Medical Universities in Istanbul and one of the main medical schools in Turkey offering Turkish and English Medical programs. The Neurology Department consists of 36 adult and six children beds. In total, six consultants, 16 residents, seven fellows and 24 master students in electroneurophysiology work in the department. The undergraduate (medical school) training is followed by a minimum of four years of residency training in neurology, which includes three-month rotations in each neurology division, and laboratories and short periods in different other specialities. In addition, numerous graduate and postgraduate educational programs are available at the Istanbul University Cerrahpasa School of Medicine Neurology Department. Due to the large variety of divisions and units covering the complete field of neuroscience complemented by a multidisciplinary approach, the Neurology Department is able to provide comprehensive services for the diagnosis, treatment and care of patients with a wide range of neurological conditions. Further, it is one of the most esteemed centers for research and education in Turkey. The young neurologists and trainees then enjoyed a guided hospital visit through the Neurology Department where each unit’s health professional welcomed them and explained their field of expertise. The divisions in the Neurology Department include Clinical Neurophysiology and Epilepsy, General Neurology, Pain Disorders and Headache, Neuromuscular Disorders, Neuroimmunology/Multiple Sclerosis, Sleep Medicine, Paediatric Neurology, Vascular Neurology and Movement Disorders. This allowed the participants to discover the Clinical Neurophysiology/EMG unit where more than 3,000 patients are investigated annually. In addition, more than 500 patients are followed up for various neuromuscular disorders and more than 300 patients for botulinum toxin injections. Afterward, the neurologists visited the epilepsy center with an electroencephalography laboratory where annually more than 2,000 patients referred from all over Turkey are seen, and more than 6,000 patients are followed up with different epileptic disorders. At the end, Siva invited all participants to a dinner and get-together at the restaurant of the Istanbul University. Besides this profound insight into the clinical practice and the education system of neurology in Turkey, the 90 impressed young trainees and neurologists were able to experience another important aspect of the Turkish culture by tasting the delicious flavor of original Turkish food ranging from different forms of kebab, kofte, dolma, borek, mezes and other lovely desserts. Acknowledgment: The EAYNT is grateful to Siva and the Turkish Neurological Society for their friendly invitation and excellent organization of the hospital visit. In addition, we would like to thank Siva and the team of the Neurology Department for their kind provision of the presentations and pictures during the hospital visit. Delegates and staff of the Dakar Conference on the formation of CAA. Paul Kioy, Anthony Zimba, Gallo Diop, Lionel Carmant, Calixte Kuate, Sokhna Ba, Mansour Ndiaye, Mareme Sene, Nico Moshe, Late Bryan Kies, Birinius Adikaibe, Emilio Perruca, Pierre-Marie Preux, Baba Koumare, Sammy Ohene, Amara Cisse, Michel Baulac, Sam Wiebe. The enormous challenges facing epilepsy care in Africa, especially in poor and rural areas, cannot be overemphasized. All human development indicators, despite some improvement, remain low and unacceptable. Faced with other pressing issues and social conflicts, bringing epilepsy to the forefront has been an uphill task. In recent years, the number of training institutions for doctors and nurses has increased and more qualified personnel in the area of neurological disorders have been trained. The number of diagnostic equipment and specialist centers for neurological diagnosis has grown. However, for a reasonable impact to be made, efforts geared toward increasing awareness, advocacy, reducing the price of medications and improving access to care and research to a more coordinated approach are required. To achieve these aims, the International League Against Epilepsy (ILAE) set up the Commission on African Affairs in 2010 in Dakar, Senegal. The official inaugural meeting of the African commission of ILAE took place in November 2010. The parent body, ILAE, convened, and Prof. Amadou Gallo Diop of Senegal and Senegalese League Against Epilepsy served as a facilitator. Representatives from the following countries were present: Dr. Calixte Kuate-Tegueu (Cameroon), Dr. Sammy Ohene (Ghana), Prof. Amara Cisse (Guinea), Prof. Paul Kioy (Kenya), Prof. Baba Koumare (Mali), Dr. Birinus Ezeala-Adikaibe (Nigeria), Prof. Amadou Gallo Diop (Senegal), Dr. Brian Kies (South Africa) and Dr. Angelina M Kakooza (Uganda). ILAE delegation was led by Prof. Solomon Nico Moshe (President, U.S.), Prof. Emilio Perucca (Treasurer, Italy), Prof. Sam Wiebe (SecretaryGeneral, Canada), Prof. Michel Baulac (Second Vice President, France) and Prof. Lionel Carment (Canada). Invited observers were Prof. Alfred Njamnshi (President of Pan African Association of Neurological Sciences, Cameroon), Prof. Pierre-Marie Preux (Tropical Neurological Institute of Limoges, France) and Dr. Anthony Zimba (IBE Africa Commission, Zambia). Prof. Mansour Ndiaye, head of the Department of Neurology of the University of Senegal, read a welcome address. Prof. Solomon Moshe followed and talked about the history of African Commission, including failures and challenges. The present and past efforts of the country’s Leagues Against Epilepsy were discussed in presentations. Carmant, Wiebe and Preux made presentations, showing the great opportunities and prospects of working as a team to develop the African Commission. It was noted that a lot of work has been done or is presently going on in various parts of the continent, but there is a need for proper coordination and collaboration. The second day of the meeting was dedicated to the formation of the commission (ILAE-CAA). The executive members of ILAE emphasized the benefits of working as a team and the successes achieved in other regions of the world and the scope of the future CAA based on ILAE bylaws. Moshe encouraged the African Commission to move forward and work as a team despite the envisaged challenges. He urged them to call on the parent body for help when the need arises. He said the North American Commission is looking forward to building a partnership in Africa to promote the treatment of epilepsy and research into newer epilepsy syndromes. Later in the day, the potential members of CAA discussed and elected the officers that will run the commission until 2015. The officers were selected (see below) and were later endorsed by the international executive. Further work was done in setting out the commission’s Action Plan for 2011-2015. Delegates and staff of the Dakar Conference on the formation of CAA are Paul Kioy, Anthony Zimba, Gallo Diop, Lionel Carmant, Calixte Kuate, Sokhna Ba, Mansour Ndiaye, Mareme Sene, Nico Moshe, Late Bryan Kies, Birinius Adikaibe, Emilio Perruca, Pierre-Marie Preux, Baba Koumare, Sammy Ohene, Amara Cisse, Michel Baulac, Sam Wiebe. The commission’s task was to consolidate gains and create awareness of epilepsy and related disorders. Every avenue should be used, including newspapers, radios, television and community-based programs. Organization of the second African Epilepsy Congress (May 22-24, 2014, in Cape Town, South Africa). Epilepsy training courses will be organized in French, English and Portuguese. Provide the list of epilepsy training centers in Africa and organize the visiting professorship in these centers. Consistency and feasibility of ideas remain the goal of commission. Birinus is the communication officer for the Commission on African Affairs, International League Against Epilepsy. At this unique meeting organized by the European Federation of Neurological Societies (EFNS) and the European Neurological Society (ENS), more than 5,900 neurologists from 102 countries attended. The top countries included France, Germany, Greece, Italy, Romania, Russia, Spain, Switzerland, Turkey and the United Kingdom. But, of course, many participants came from outside of Europe. From a total number of 2,700 abstracts submitted, the Congress Program Committee led by Prof. Jacques De Reuck and Prof. Gustave Moonen selected 1,500 to be presented as electronic and paper posters. The ePoster session was a great success. There were 68 sessions, including eight symposia, focused workshops, oral sessions and special sessions. The education program consisted of 25 teaching courses and three practical courses. During the lunch breaks and in the evening, pharmaceutical companies organized 11 satellite symposia. Similar to previous congresses, young scientists had the opportunity to compete in the Tournament for Young Neurologists. The Subspecialty Scientific Panels chose the best presentation in their field. All the participants were winners, since the congress evaluations showed that the scientific program as well as the organization was excellent. The highlight of this congress was the foundation of the European Academy of Neurology (EAN). EFNS and ENS came together to found this new society. Currently, 45 national neurological societies and 800 individuals are registered members of EAN. EAN represents more than 19,000 European neurologists. The first EAN Congress is scheduled to take place June 20-23, 2015, in Berlin. 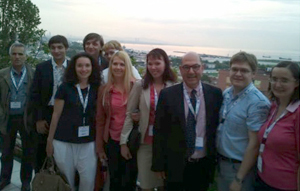 The First Joint Congress of the ENS and EFNS took place in June 2014 in Istanbul. Rudolf Martini, Würzburg, Germany, was the first speaker of this session and talked about opportunities for treatment of CMT diseases. At the moment, there is no cure for these genetic neuropathies. Studies (mouse and human) with many substances studied, such as ascorbic acid, progesterone antagonist, curcumin, neurotrophin 3, carried out without success. In the German laboratory, mediators for the involvement of phagocytosing macrophages have been detected in the demyelination and perturbation of axons. These mediators are monocyte chemo-attractant protein-1 (MCP-1; Ccl2) and colony-stimulating factor-1 (Csf-1). The idea was that attenuating macrophage-related peripheral nerve inflammation could be a putative option to ameliorate disabling symptoms associated with CMT-1. Phase 1 clinical trials with a highly selective Csf-1-receptor inhibitor were promising. Another approach injected human adipose-derived mesenchymal stem cells (MSCs) isolated from lipo aspirate into tail veins of Cx32-deficient mice, a model for CMT-1X. Single injection of these immune modulatory xenografts caused macrophage attenuation and mild preservation of myelin. Next, Rayaz A. Malik, Manchester, United Kingdom, presented on diabetic neuropathy. The problem in finding the optimal tools for diagnosis and treatment is the design of studies. What should be used for primary endpoint? Clinical status, vibration threshold, electrophysiological findings? Pieter A. van Doorn, Rotterdam, discussed how to optimize treatment in immune-mediated neuropathies. About one-fourth of patients with GBS develops respiratory insufficiency, and many have signs of autonomic dysfunction and pain. Prognostic models can help to predict the chance that an individual patient will require artificial ventilation, and to predict the probability to walk unaided after half a year. EGRIS score and mEGOS are tools that can be used early in the course of disease. Treatment is well known with intravenous immunoglobulin (IVIg) or plasma exchange. Important to consider that about 10 percent of GBS patients will have a treatment-related deterioration (TRF), requiring a repeated treatment course. Other patients initially diagnosed as GBS will turn out to have acute-onset chronic inflammatory demyelinating polyradiculoneuropathy (A-CIDP). Treatment of CIDP include steroids, IVIG and plasma exchange. Most patients need intermittent maintenance treatment. The session ended with an overview of treatment in amyloid neuropathy (AN) from David Adams, Kremlin-Bicàªtre, France. As AN is a systemic disease, patients should be screened for cardiologic, renal and ocular manifestations in transthyretin FAP (TTR-FAP) or hematologic involvement for light-chain amyloidosis (AL-amyloidosis). To remove the main source of variant TTR, liver transplantation is performed depending on the stage of the neuropathy, the variant TTR, the age of the patient and severity of organ involvement. Liver transplantation, which has been performed since 1991, has better results in early onset. Pacemaker implantation should be discussed in case of significant conduction disorder. Heart or kidney transplantation must be discussed in end-stage cardiac or renal failure in Stage 1 neuropathy. For light chain amyloidosis, chemotherapy, in combination with high dose dexamethasone, is used to control the underlying plasma clone that produces amyloidogenic light chain. Another option is the application of monoclonal antibodies against human serum amyloid P component. At the moment, a Phase 1 study is ongoing in the U.K.
Prof. Cavaletti, Italy, talked about chemotherapy-induced neuropathies (CIPN), which present an increasingly clinically relevant issue. Due to improvement and extension of chemotherapies, the overall survival rate of tumor patients is rising, though the number of the exact incidence is lacking. However, neurotoxic drugs with substances such as platin derivates, taxanes, vinca-alcaloids, bortezomib and thalidomide are becoming a major dose-limiting factor. The epidemiology is still unclear. CIPN are dose-dependent and occur after a cumulative dose, mostly after three to four cycles. CIPN are predominantly sensory with dysaesthesia, paraesthesia, burning sensations, pain, ataxia and gait disorders. Motoric or autonomic, as well as, cranial nerve involvement is rare. Oxaliplatin should be highlighted, as it induces acute transient side effects as coldness-associated pain, and muscle cramps especially in the jaw and bulbar distribution. An important issue is “coasting.” Patients treated with platinum derivates may develop worsening neuropathic symptoms after treatment has ceased. For the clinical involvement and evaluation of CIPN, questionnaires are used, such as the Total Neuropathy Score (TNS) or the National Institute Cancer Toxicity Scale (NCI-CTC). The sensitivity is limited due to interindividual reliability. Measurement of sensory and motor nerve conduction velocity (NCV), sensory nerve action potential (SNAP) and compound muscle action (CMAP) together with electromyography (EMG) are standard neurophysiological tests used. Diminished amplitude of SNAP in NCV is thought to reflect axonal loss from sensory nerves. In case of inconclusive results, a skin/nerve biopsy may be considered. Pre-existing neuropathies, due to diabetes, alcohol abuse or hereditary neuropathies as well as concomitant chemotherapies may facilitate or worsen CIPN. However, the correlation remains unclear. Neuroprotectives are still lacking. Several substances have been tried but without success. Symptomatic treatment targeted with either neuropathic pain therapy or physical therapy and rehabilitative measures must always be considered. In summary, CIPN present a serious adverse effect due to limitation in quality of life. Studies with the evaluation of biomarkers to identify patients with the high risk of developing CIPN are needed. Data of long-time effects are lacking. Further studies are needed to achieve a standardized treatment of CIPN and its complication. Oral sessions and teaching courses were provided throughout the congress, spanning all relevant topics from idiopathic Parkinson’s disease to hyperkinetic movement disorders. The first two days were dedicated to Parkinson syndromes in general and organized as oral sessions focused on novel diagnostic and therapeutic strategies. The first session included an interesting prospective cohort study, which explained the potential meaning of a particular olfactory assessment in early diagnosis of Parkinson’s disease in patients with rapid eye movement sleep behavior disorders. The use of apomorphine was highlighted as good therapeutic option in patients with morning akinesia and reviewed as a reasonable drug for improved quality of life in a multicenter prospective French trial. 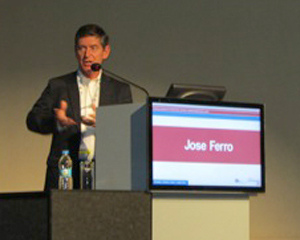 Atypical Parkinson syndromes were discussed in a separate session, underlining autonomic disorders as a leading symptom in the diagnosis of MSA. An extrapyramidal syndrome with rapid progression, poor response to L-Dopa and other uncommon symptoms such as early dementia, apraxia or stridor should be considered as an atypical Parkinson’s syndrome. Stridor in particular seems to be an underestimated symptom in this differential diagnosis. On the other hand, fragile-X-associated tremor-ataxia-syndrome was introduced as a rare but possible differential diagnosis in patients with atypical Parkinson syndromes. The therapeutic approaches on MSA are still limited, since rasagiline, lithium and fluoxetine failed to prove a significant benefit. Although accompanied by a poor prognosis, MSA should be considered as a heterogeneous disease with a challenging effort in diagnostic and therapeutic efforts. A highlight of this year´s congress was the interactive sessions in which patient videos were presented, and the audience could vote among several differential diagnoses. In the session “paroxysmal events” intermittent movement disorders, as the paroxysmal kinesigenic dyskinesias (PKD) with sudden attacks of involuntary movements, including dystonia, chorea, athetosis or ballism, precipitated by sudden movements were shown. Also presented, patients with paroxysmal non-kinesigenic dyskinesias (PNKD), that usually occur spontaneously or may be triggered by consumption of alcohol or caffeine, and the paroxysmal exercise-induced dyskinesia (PED). Examples of faciobrachial dystonic seizures, nocturnal frontal lobe epilepsy and L-Dopa-induced dystonic-ballistic dyskinesias in Parkinson’s disease demonstrated the difficult differentiation against psychogenic movement disorders. Diederik van de Beek, Amsterdam, presented the first session about bacterial meningitis. He presented the dilemmas in the diagnosis of acute community-acquired bacterial meningitis and focused on strategies to optimize antibiotic efficacy in view of increasingly drug-resistant bacteria. He also discussed the role of current and future adjunctive therapies. Clinical data to support new antibiotics in the treatment of multidrug-resistant bacteria are scarce. Whether adjunctive anti-inflammatory therapies (e.g. dexamethasone) improve outcomes in patients with bacterial meningitis remains controversial and are being tested further. In the European clinical trial from 301 adults with meningitis who started dexamethasone 40 mg/d for four days before/with first dose antibiotics, it decreases mortality and hearing loss. Another adjunctive therapy, hypothermia, tested by a randomized open-label, blind endpoint trial has no beneficial effect. Rapid diagnosis and treatment reduces mortality, therefore it should be started simultaneously with an adjunctive therapy. Johann Sellner, Austria, then talked about strategies to improve the outcome of viral encephalitis. Early suspicion and diagnosis are crucial. A delay of more than two days between admission to the hospital and antiviral treatment has a poor outcome. The clinical spectrum of presentation is broad and leads to misdiagnosis such as altered mental status, sepsis and seizures. Herpes simplex virus (HSV) and varicella zoster virus (VZV) are most commonly involved in sporadic disease, while in about one third of the patients the agent cannot be identified despite extensive diagnostic efforts. The correct dosage of acyclovir is given in 75 percent of cases and should be IV 10 mg/kg every eight hour for a period of 14-21 days. In cases of negative PCR and no alternative diagnosis by suspected HSE, the duration of therapy is for 10 days. M. Titulaer, Barcelona, Spain, then discussed autoimmune encephalitis . He mainly focused on anti-NMDA receptor encephalitis, the clinical picture, treatment and outcome. Clinical symptoms, abnormal CSF with lymphocytic pleocytosis, raised total protein and oligoclonal bands; abnormal EEG and MRI are essential for the diagnosis. After a prodromal phase, the clinical deterioration starts with symptoms of agitation, psychosis, catatonia, memory deficit, speech reduction, abnormal movements and seizures to coma, hypoventilation and dysautonomia. Other types of encephalitis as LGI1-encephalitis and its clinical symptoms such limbic encephalitis, memory loss, myoclonic-like movements, hyponatremia, seizures and its outcome were presented and discussed. Philip Scheltens, Amsterdam, opened with comments about prevention for Alzheimer’s disease. It is a challenge not only for neurologists but also for all health care systems in Europe because dementia will become the most significant brain disorder in the next 30 years. Obesity and smoking increase the risk of developing dementia, while physical activity and moderate alcohol consumption decrease the risk. Consequent blood pressure treatment is successful in prevention whereas statins and vitamin B12 substitution showed no effect. A current ongoing trial is the pre-DIVA (Prevention of Dementia by Intensive Vascular Care) study with 15,000 person years. It will be completed in 2015. Protective genes are identified – for example, APOE 2 and APP mutation A673T. Antiamyloid strategies with immunotherapies (bapineuzumab, gantanerumab), anti tau therapies, neuroprotection and dietary interventions are subjects of studies and are expected soon. Jonathan Schotts, London, presented on the connection between dementia and immune mediated syndromes. Whereas patients with degenerative dementia are older and show slow progression with “little neurology” as well as atrophy in MRI-scans, autoimmune dementias occur in young/middle-aged patients with sub-acute onset. Symptoms include confusion and delirium. Progression is rapid and MRI shows signal changes. Classical antibodies are anti Hu, Ma1+2, amphiphysin, in the last 10 years, antibodies directed against the voltage-gated potassium channel complex have been detected, which can produce a sub-acute and potentially treatable limbic encephalopathy usually in the absence of an underlying tumor. Subsequent studies have defined specific antigenic targets (LGI1, CASPR2 and contactin-2) within the potassium channel complex. Facio brachial dystonic seizures precede the development of cognitive decline and are immunotherapy responsive. As a consequence, the treatment may prevent cognitive impairment. Other rare antibody-mediated encephalopathies, including those associated with antibodies directed against NMDA, AMPAR, GABA-B, GAD and Glycine receptors, are now recognized. Sandro Sorbi, Florence, talked about causes for rare dementias. An overlap between uncommon dementias and young-onset dementia can be derived from the epidemiological data. This could be young-onset forms of common neurodegenerative dementias such as familiar Alzheimer’s disease, dementia associated with other neurological disorders (Huntington’s disease, myotonic dystrophies, autosomal dominant cerebellar ataxia or hereditary spastic paraparesis) or late-onset forms of childhood conditions, such as mitochondrial disorders, lysosomal storage disorders and leukodystrophies. Inflammatory disorders and infectious or toxic-metabolic abnormalities also can be the causes of rare dementia. Clinical data are not sufficient. Most of them are based on single case reports. Murat Emre from the host city Istanbul, closed out the congress talking about Parkinsonism associated with cognitive impairment. Two forms can be discriminated dementia with Lewy Bodies (DLB) and dementia associated with Parkinson’s disease (PD-D). There also are mixed forms such as “Lewy-body variant of Alzheimer’s disease.” In both biochemically a cholinergic deficit exists, which can be demonstrated in autopsy and PET studies. For this reason, cholinesterase inhibitors have been shown to provide some benefits in both conditions. Clinically, patients show decreased performance in executive functions, visual spatial functions and present with hallucinations. There are more similarities than differences in these two syndromes. Surböck is from the Department of Neurology, Kaiser Franz Josef Hospital, Vienna, Austria. Tinchon is from the Department of Neurology, Kaiser Franz Josef Hospital, Vienna, Austria. Alpaslan is from the Department of Neurology, Kaiser Franz Josef Hospital, Vienna, Austria. Pollanz is from the Department of Neurology, Kaiser Franz Josef Hospital, Vienna, Austria. Grisold is from the University Clinic of Neurology, AKH Vienna, Austria.